Here at Lilli Pilli Dental, we use the latest state of the art technology to fully diagnose, plan and complete treatment to a higher degree of success and precision than what has been the norm previously. While CT (computed tomography) imaging has been used in the medical field for over 30 years, it is becoming the new diagnostic tool of choice for orthodontic, TMJ and implant analysis, diagnosis and treatment planning due to the latest advancements in diagnostic technology, such as the revolutionary iCAT system. This three-dimensional CT technology can provide a quicker full scan of the head than traditional two-dimensional imaging, allowing orthodontists a better visualization of the hard and soft tissues of the craniofacial structures from several perspectives. In addition to the advantages of traditional CT scans, the Cone Beam releases up to 90% less radiation than traditional X-ray machines, enhancing your safety while providing crisp, clear images for more efficient diagnostic analysis and treatment. We feel our modern, cutting-edge techniques ensure you are receiving the quality care you deserve. The iCAT Cone Beam 3-D system can immediately produce three-dimensional images in under 1 minute. This in-office, easy-to-use system provides your Dentist a comprehensive view of all oral and maxillofacial structures, dramatically increasing the efficiency with which your Dentist is able diagnose your condition and plan for your treatment. CEREC (CEramic REConstruction) is a technology that allows us at Lilli Pilli Dental to produce ceramic and porcelain dental restorations using a variety of computer assisted technologies, including CAD/CAM. With CEREC, our Dentists at Lilli Pilli Dental can do one visit appointments for dental work such as crowns, onlays, inlays, and veneers. For more information, visit our CEREC page. 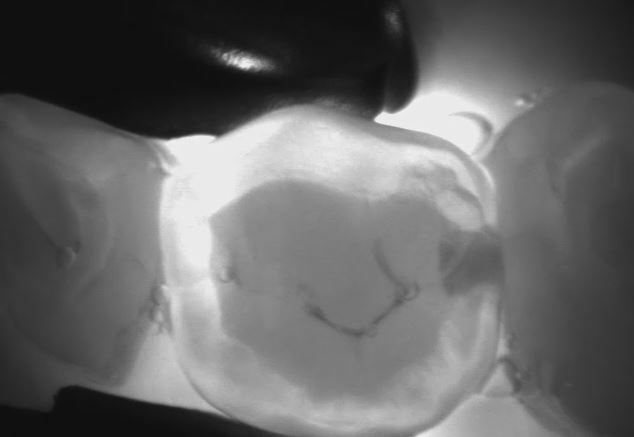 We here at Lilli Pilli Dental regularly use intra-oral cameras to help us diagnose decay, show patients fractures in teeth and to zoom in on problem areas. We take still pictures using the intra-oral camera and are quickly and easily able to display them for you on our computer monitors. We can show you where we see a fracture in a tooth that would best be repaired by crowning it. We can show you areas of decay that need to be filled. We can show you where you have tartar build up and where we removed it. Intra-oral cameras do not rely on radiation. Used in conjunction with x-rays, the intra-oral camera can help us make an accurate diagnosis for your teeth. The intra-oral camera can help us keep track of changes in your teeth. We can save pictures in your chart to use as comparison down the road. DIAGNOcam is a revolutionary new way for your dentist to find even the smallest areas of tooth decay and cavities. By using the advanced DIAGNOcam technology, we are able to treat small cavities and areas of tooth decay before they become larger issues requiring multiple procedures. DIAGNOcam is a quick, comfortable process that helps you and your doctor keep your smile healthy and happy for a lifetime. DIAGNOcam uses Digital Imaging Fiberoptic Transillumination (DIFOTI) technology. This means the structures of the tooth become light conductors. A digital video camera captures the context and transmits to a live monitor. Carious lesions and cracks block the light transmission and become visible as dark spots. This is radiation-free and can be repeated as required. X-ray diagnosis remains important. DIAGNOcam is a convenient way to verify and supplement your X-ray diagnosis and is particularly useful when performing diagnosis on children or pregnant women. DIAGNOcam is comfortable and takes only a few short minutes to scan your entire mouth for cavities and decay. Detecting tooth decay as early as possible helps eliminate the number of costly treatments that you may need down the line and helps treat small problems before they become serious dental cases. Not all cavities are noticeable without the help of the advanced DIAGNOcam screening. Most tooth decay begins in the tiny cracks and grooves of your tooth's surface. By the time the cavities are noticed, it's often because there is a much larger problem, and the cavity itself was never seen or felt by the patient. With the widespread use of fluoride, many of these cavities never make it to the tooth's surface, and instead begin eating away at the tooth from the inside out. The DIAGNOcam helps locate these small areas of decay.